The day of the hike dawned unseasonably cold and misty. I tossed and turned all night and by the time my alarm rang at 6:00 am, I was already exhausted. I grabbed an H4 bus to the Cleveland Park Metro Station and waited 40 minutes to get on a train to Shady Grove to take advantage of a shuttle to the starting point at White’s Ferry. As the train got closer to Shady Grove, I was joined by other passengers who looked like they were also ready to hike. We reached our destination at 8:10 am, and I followed the other hikers to where the shuttle buses were waiting. As I walked, I felt my sandal slide out a bit from under me. My flip flop had taken a side trip into a pile of goose poo. This was a great omen for the day’s adventure. Sireen met up with me in line as I was wiping goose business off my shoe. Up until this point, I sort of thought this was some kind of crazy fantasy that I’d dreamed up. Either the hike wasn’t going to actually happen or one of us was going to turn to the other and go, “Just kidding – let’s head back home!” Once we were sitting on the bus surrounded by other hikers, everything suddenly felt real. 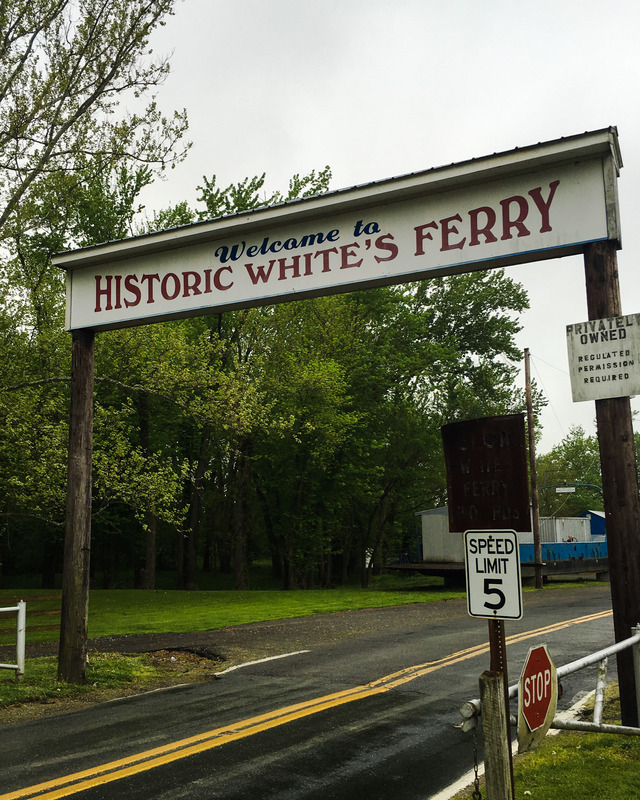 We arrived at White’s Ferry, checked in, dropped off a bag of personal items for pick up at the end, and started stretching and getting ourselves mentally ready for the hike. A little bit before 10:00 am, Mike Darzi, one of the event organizers, gathered us for a hike and safety briefing. Then, we were officially off. 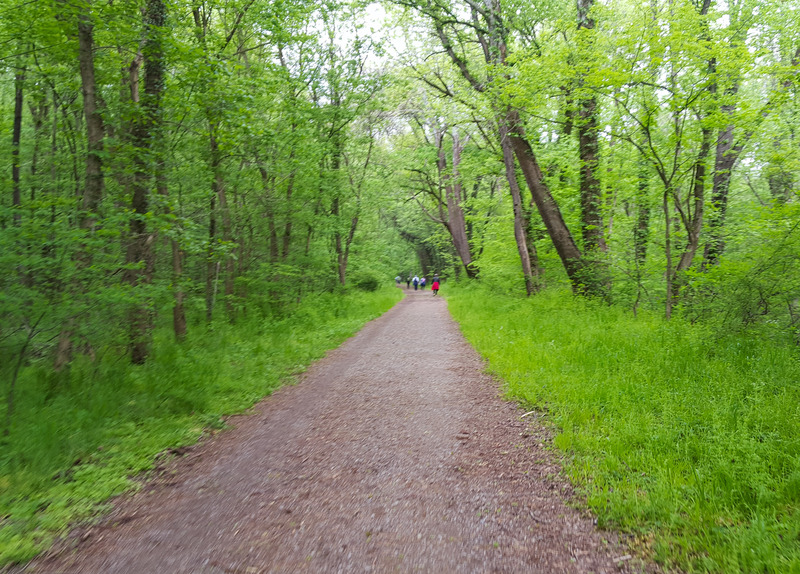 In order to reach the full 50K mark, we had to backtrack a bit, walking toward DC for 2.25 miles and then circling back to the White’s Ferry parking lot. Of course, I didn’t want to cheat myself out of hitting 50K, but it was still frustrating to start the outing by backtracking. We had a long day ahead of us, I wanted to make progress toward the finish line at Harpers Ferry, not walk in circles! In those first few miles, the group started naturally separating, with faster hikers moving toward the front and slower hikers drifting toward the back. We fell into the middle of the pack and started walking and talking with two girls who we met in the White’s Ferry parking lot. 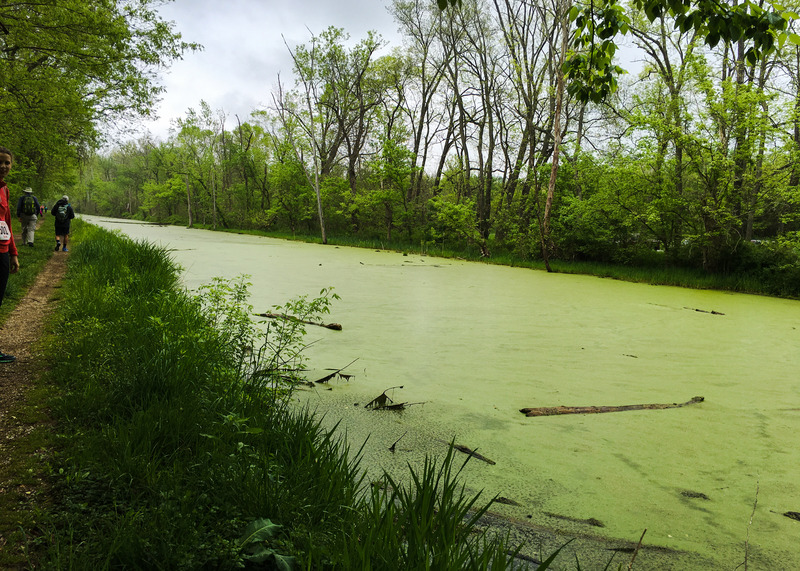 At 4.5 miles (7.3 km), we returned to our starting point at White’s Ferry. Finally, we were making progress! The four of us powered through the next 6.4 miles. The flat canal made for easy walking, the temperature was comfortably cool, and the morning rain had petered out. It was also kind of nice having new talking buddies for a little while. 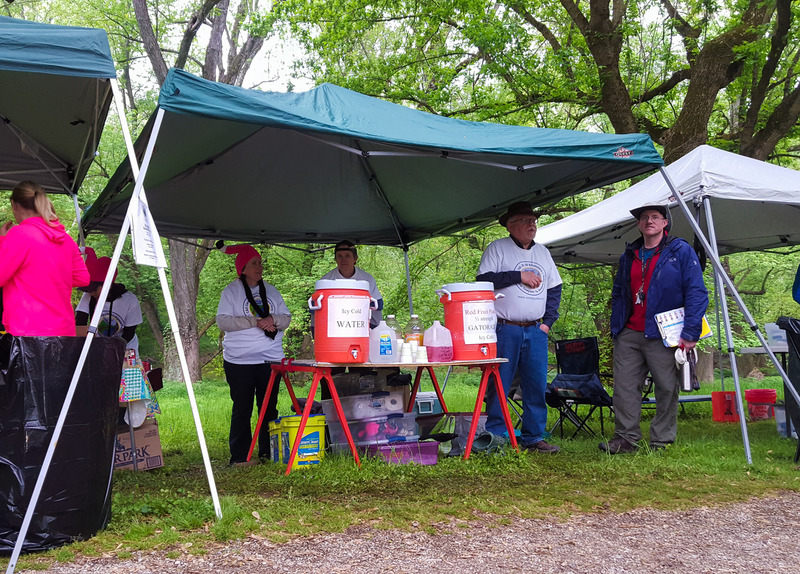 While we were no longer tightly clustered in a huge group, we were still surrounded by a lot of other hikers as we entered the first big aid station at Monocacy River Aqueduct located at mile point 10.9 (17.5 km). We were making great time. We arrived at 1:11 pm, which meant we were averaging about 3.5 miles per hour, slightly faster than I anticipated us going. We made a quick stop at the outhouse and grabbed a few snacks before getting back on the trail at 1:29 pm. About two miles from the Monocacy River rest stop, I noticed what looked like tents and people up ahead. It was way too soon for us to be at our next rest stop, so what could that be? The evening before, while I was finishing up my last blog piece, I stumbled on the website for the C&O Canal 100, a 100-mile race that was also taking place on the C&O Canal on April 29. Were these the ultra-runners? As we approached the tents, we called out to the people manning what looked like a food tent. They confirmed that they were the 39-mile rest station for the ultra event. As we walked past the aid station, we encountered our first runner, a woman who looked like she was in her mid-50s. She had slowed down to a fast walk, so we used the opportunity to ask some questions. We learned that she’d previously completed several ultra-runs, and expected to be done with this one at around 7:00 am the next day — 24 hours after she started. As we kept walking, more and more runners passed us on their way to and from the 39-mile aid station. At this point, these runners had completed a marathon and a half, and most of them looked great. I know you don’t end up in a 100-mile race unless you really know what you’re doing. Still, watching them was just incredible. I’ve read a fair number of articles about ultra-marathoners, but I never thought about what it would be like to actually see them in action. Honestly, if I happened to stumble upon one of these runners in the street, I would assume that they’d just done an easy loop around the block – they looked that good. Hanging out on the same course as the 100 milers could have discouraged us. I mean, compared to what they were doing, 50K was nothing. If anything, though, it was actually inspiring. A lot of the runners said encouraging things as they passed us, which of course, we returned in kind. Some of them even paused to ask us questions about our event. The fact that they even bothered to acknowledge us in the midst of their super-intense ultra-run, made me feel better about what I was doing. Our events might have been very different, but we were all partners in taking on extreme distances. It also put things into perspective. If they could run through the night and hit the seemingly impossible goal of 100 miles, then I knew I could do 50K — no problem. At 17.1 miles (27.5 km), we reached the Point of Rocks rest stop. We arrived there at around 3:21 pm — 5:21 hours after starting. For this stretch, we averaged 3.3 miles per hour. Point of Rocks could have easily been called Point of Awesome. By the time we got there, I was more than ready to take a break and enjoy the lunch food we’d been told would be waiting for us. The hike organizers didn’t disappoint. The first thing I noticed as we walked up were helpful volunteers putting together sandwiches. These were Sandwiches – with a capital “S.” We had a choice of turkey, ham, or peanut butter. I went the turkey route. I’m not gonna lie, the Kirkland’s brand roast turkey would have grossed me out a little on a normal day, but the combo of wheat bread, turkey, mayo, and provolone was like magic in my tummy. I could have eaten 30 of them. We rested for a bit and then stretched. I pulled off my shoes and checked the foot situation. I decided not to change my socks (a choice I lived to regret a few hours later). Then, I nommed on M&Ms and some salty treats. We only paused for a little more than 20 minutes, but it was re-energizing. I almost had a skip in my step for the first two miles after we left the rest point. This positive feeling did not last. I did some research in advance of this hike, looking for studies and articles on the effects of hiking/walking extreme distances. I didn’t find much related to my area of exercise, but I did discover plenty on marathoners. One thing from my research stuck with me – runner’s trots – the extreme need to do number two while running. I don’t have any data to back this up, but I think I experienced the more subdued, hiker version of this phenomenon. In the midst of this internal drama, I started experiencing an additional issue as a muscle in my right leg started tightening. There was just too much happening with my body, and I needed to slow my pace down even more to cope. We were almost at the Brunswick rest stop, so I told Sireen to walk ahead and kept going at my own pace. There was this weird sensation of tightness emanating from a muscle located near my hip. The discomfort in my leg was unexpected since I don’t usually have problems with my right side. With the benefit of Google, I now think I was having problems with my tensor fasciae latae. I wasn’t in pain, but I also couldn’t get it to loosen up, so I just kept going, pushing my body through it. As I approached Brunswick, I had to ask myself: Could I keep walking with the amount of discomfort I was experiencing? If I was going to drop out, then the time to do it would be coming up at the 23.9-mile rest stop. If I chose to keep going forward, then I was committing myself to finishing regardless of the state of my leg. The trail opened up and suddenly there were people everywhere. Brunswick turned out to be a major rest stop not only for us but also the 100 milers. Tons of their family members and supporters were gathered around the rest area and the atmosphere was very celebratory. 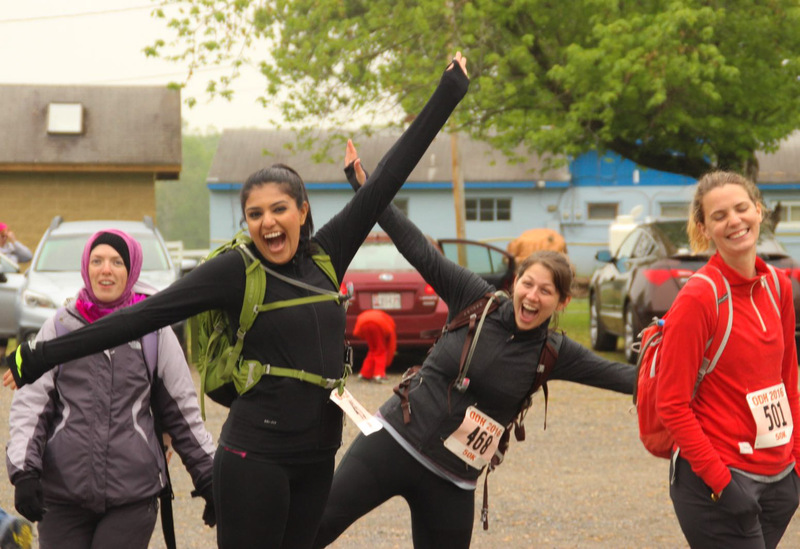 Sireen met me near the beginning of the 100 milers’ tents, and then I made a beeline to the porta-potties. After, we headed over to our rest area, which was located just beyond the one for the 100 milers. We arrived at 5:58 pm. Our pace for this stretch had slowed to 2.96 miles per hour, but that didn’t change the fact that we’d knocked out 23.9 miles (33.5 km) in only 7:58 hours. I must have had “discomfort” written all over me because one of the medical personnel stopped me shortly after we arrived. “Any hot spots? Do you want to take off your shoes for me?” he asked. In retrospect, I don’t know if I made the best choice in that moment. Really, if I could have gone back in time, I would have switched out my socks and aired out my feet back at the 17.1-mile mark. Given the way I felt at this point, I do believe that if I’d taken off my shoes I would have been done. For better or worse, having that conversation with the first aid person gave me the internal permission I needed to keep going even though a large part of me wanted to quit. I sat for a few minutes and then stretched out my tight leg. I was feeling a little bit better and got that rush of energy that comes from getting a break. Then I was up and ready to go all the way to the end. The first mile was fine. Without my body’s needs bringing me down, I was able to take my pace back up to just below fighting form. I couldn’t last at that rate. My right leg muscle began to tighten again and I started to feel some kickback from my blisters. The rain that had held off all day started moving in and it was accompanied by choking humidity. I began to feel nauseous as the air closed in around me. It got to the point where I actually wanted it to start raining just to make the suffocating feeling go away. My body started screaming at me to slow down, and I knew it was time for Sireen and me to part ways. Once we split up, I doubted I would catch up to her again. 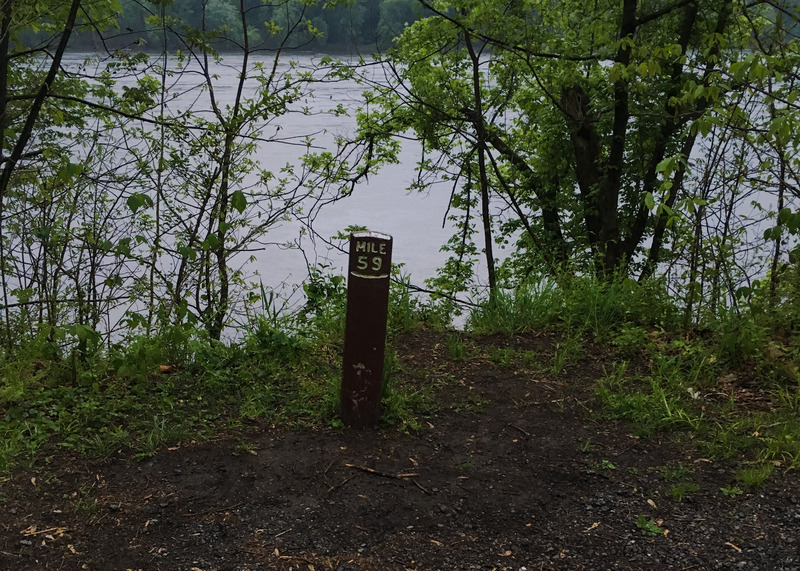 We reached milepost 57 – only 5.5 miles left, just shy of 26 miles. “You know,” I told her, “when you hit the next milepost you’ll have done a marathon.” Saying it out loud gave us both a little extra boost to keep going. And with that said, we agreed to go our separate ways. She sped up to her natural pace, and I started to slow down to mine. It’s not like Sireen instantly disappeared. I walked steadily behind her, watching as she slowly got further and further away. The rain finally started falling and she turned around to share an exasperated look with me, then we continued, hiking our own hikes as we drifted apart. Alone, my thoughts trickled down to nothing. I focused only on moving one leg and then the other. And then, a woman passed me on my left. I didn’t think much of it. Even with the thinning crowd of hikers and runners, people were still passing me occasionally, especially as I slowed my pace. I thought she was going to just keep going. It was clear that she was moving faster than me, but something about me must have stood out to her. Instead of walking ahead, she slowed down and started talking to me. At first, I wasn’t very responsive. I was lost in my own discomfort, using all of my energy to keep myself going. But the woman, Brenda, was so nice that I felt bad not at least trying to talk back. With my increasing pain and stiffness, I struggled to find decent small talk topics. One of the 100 milers ran past us. I’d had so many questions about the 100 milers as they passed us (and passed us again) during our hike. Some of them talked to us briefly, but they were too busy to chat for long. Now was my opportunity to finally get some answers. I learned that this was her son’s third time doing this event and that he’d done all kind of ultra-running events — 70 milers, 100 milers, even one where he had 12 hours to just run as far as he could go. Despite her flippant response, I could tell from our conversation that she was incredibly proud of him. She told me about his drive to take his love of running to the next level, which led him to participate in these intense events. I have no idea what her son’s name is, but I have a lot of respect for him and the lengths he’s gone in his pursuit of his passion. Brenda was originally from Harpers Ferry and she knew this part of the canal very well. I’d read about the trail before heading out on it, but reading and experiencing are two very different things. 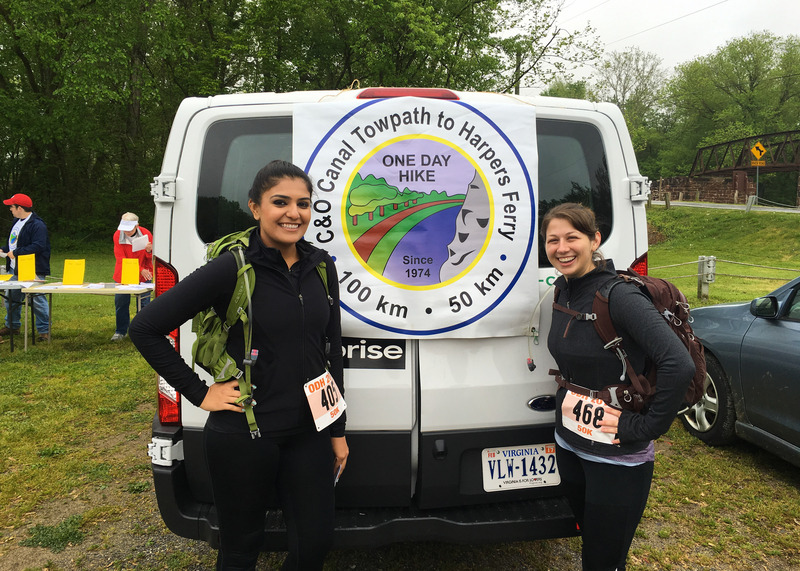 She knew that we were close to the bridge that would take us over the Potomac River and into Harpers Ferry, and her updates motivated me to keep going, even as the rain started falling harder and night fell, forcing me to rely on my headlamp. Up ahead, the bridge came into view. My heart soared — the end was practically in reach! Two volunteers met us at the bottom of the steps and directed us up the bridge. With the rain pouring down, we took our aching legs and gingerly made our way up the metal grated steps. The walkway at the top was wooden and slick. The rain-swollen Potomac rushed below us. We walked carefully along the wooden boards. Given how wet everything was, we were afraid to move any faster. My elation at being this close to the end was tempered by my fear of slipping and falling off the bridge and into the river. After our harrowing bridge crossing, we made it into Harpers Ferry. Reaching the base of the city, I felt hope again. I was finally in the home stretch. Soon, I would be able to stop moving and sit down. A volunteer up ahead directed us to turn. Rounding the corner, I looked up and up and up at the final mile of our route. I’ve explored Harpers Ferry during the day. One of the things I remembered most was the picturesque way it’s laid out against a large hill. All day long, people had talked about this huge hill. A few had told me that confronting it after hours of hiking would be a horrible, gut-wrenching moment that would make me or break me. Standing there drenched from the rain and unable to see the top of the hill in the darkness, I finally understood what they meant. The only positive of the giant, never-ending hill was that it let me use some new muscles in my legs. After 10+ hours of brutal flatness, it was sort of a relief to move in a new way, even if the exertion was making me breathless. We trudged up the sidewalk, passing old homes and small businesses, and I got an almost comfortable rhythm going. Brenda and I served as welcome distractions for each other. She had started worrying about her husband who told her he was going to meet her for the last mile but was nowhere to be seen. For me, Brenda’s steady stream of conversation kept me from thinking too much about the pain in my leg and the increasing discomfort in my feet. As we progressed, Brenda told me about growing up in Harpers Ferry and about making her way up this very hill to get to school. She told me about the landmarks to look for so that we would know we were close to the end. We started going downhill and the pain was almost unbearable. My feet shifted forward in my shoes and I felt every blister protest as I kept walking. As I waddled my way downhill, I could tell that Brenda was getting worried about me. She let me know that there would be one more bit of uphill and then we would be done. Finally, up ahead, a soggy volunteer with a light stick waved us down cheering, “Wooo, you’re almost done!” I felt a rush of adrenaline now that the end was finally within our reach. We crossed the street and walked up another small hill toward the Bolivar Community Center. Another volunteer waved us in the right direction with more cheers. As we walked through the parking lot, a man intercepted us – it was Brenda’s missing husband! As Brenda reunited with her family, we said our goodbyes. I don’t think I had the chance to properly thank Brenda when we were together. I was way too tired and hurt to even think straight. Brenda, if you’re out there: I don’t know if I was nice enough during the time we were together. I certainly wasn’t feeling so great when we met, and I definitely didn’t get any better as we wrapped up our hike. You met up with me at a time when I think I needed someone to rely on, even if I would never have admitted it, and I appreciate the fact that you chose to walk with me even though you could have easily outpaced me. I can only imagine that you might have needed someone too. So Brenda, if you’re reading this, I hope I helped you. Walking in the doorway of the community center, I was greeted by bright fluorescent light and cheers from volunteers. After the last few hours of walking in relative isolation in the dark, the sudden change was overwhelming. There was a woman at a table ahead of me, bags of personal items to my right, and no Sireen in sight. The only thing I could think about in those first few moments was finding Sireen. It was 9:06 pm, I’d hiked for 11 hours and 6 minutes. For this final stretch, I averaged about 2.6 miles per hour. My average for the entire 50K, including the time spent at the rest stops, was 2.8 miles per hour. One of the volunteers had to practically grab me to get me to stop at the check-in table and log my official end time. I still couldn’t spot Sireen. Had something happened to her? I grabbed my bag of personal items and slowly made my way toward the bathroom/infirmary area. Walking through the door, I heard a voice I recognized, “Sireen!” I was practically beaming with relief at finding her, I honestly don’t know if we’ve ever been so happy to see each other. She had saved me a chair next to her in the infirmary area. Even though I really needed to use the restroom, I didn’t want to miss out on a prime seat opportunity. Sitting together, Sireen showed off her blisters. I knew that I was in a similar situation, but I was a little afraid to take off my shoes. I carefully removed my first boot. Taking the shoe off hurt, which was a bad sign. I peeled off the sock, looked down at my foot, and felt a wave of fear wash over me. Parts of my foot were a ghostly white. 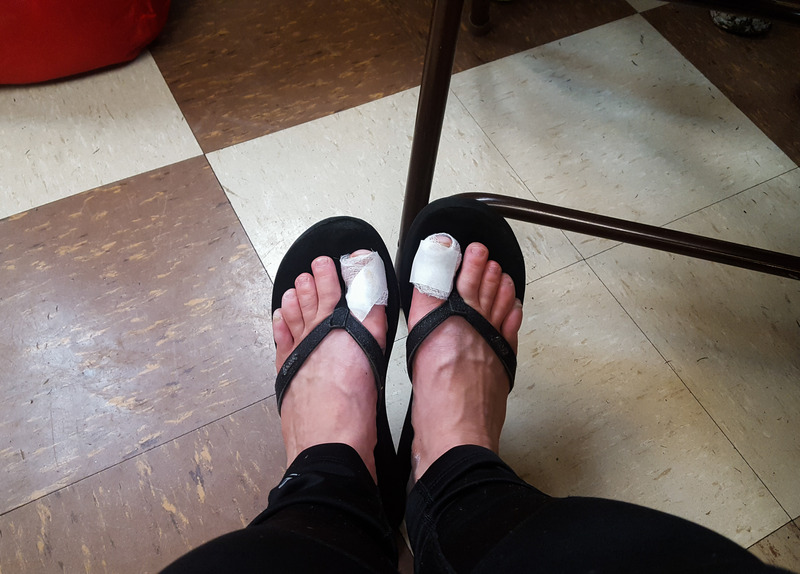 I had massive blisters on the inside of my big toe and heel. Smaller blisters dotted the back of my heel and one partially covered my pinky toe. I took off the other shoe. My left foot was almost identical to my right. An accurate description for what protruded from my big toes. They were that huge and nasty. Naturally, I was freaking out. Sireen flagged down one of the first aid station workers to come over and help me. I was worried. I asked the nurse if I needed to go to a hospital, but she reassured me that I was fine. The extra-white color of my skin was just maceration caused by prolonged exposure to moisture (caused by sweat and my choice of water resistant rather than waterproof shoes). As for my blisters, she said that they were pretty bad, but I would be fine as long as I took care of them. With my feet wrapped up and cared for, I grabbed some clean clothes and slowly made my way over to the bathroom to clean up and change. While I was in there, Sireen had an opportunity to get on an early shuttle back to the city, so she left me behind. But now, with my feet healed and the pain in my right leg a fading memory, all I can think is that I want to do this again. I want to train harder, I want to learn how to better prevent blisters, and I want to finish stronger. Is this need to keep doing extreme events a special kind of crazy? Maybe. But I keep thinking, what’s the point of living if you aren’t going to challenge yourself? I’m an average, non-science oriented person. Chances are great that I’m never going to make some kind of major discovery that changes the world. But what I can’t change in the world, I can change in myself. I can look inward. I can ask the questions: Who am I? What am I capable of? What can I achieve? And then, I can get off the couch, I can push myself to the edge of my limits, and I can discover the answers to those questions. What an awesome achievement! Way to go! Thank you so much for the kind words. I’m glad that you enjoyed reading this!